TOKYO — Ichiro Suzuki's struggles at the plate have followed him to Japan. 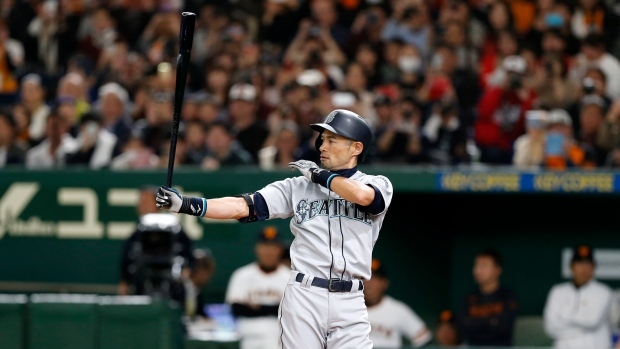 Ichiro went hitless in three at-bats on Sunday when his Seattle Mariners beat the Yomiuri Giants 6-4 in an exhibition game ahead of their MLB season-opening series against the Oakland A's. Ichiro arrived in Japan hitting just .080 in spring training this season and couldn't break out with a hit before a near-sellout crowd of 46,315 at Tokyo Dome. Cameras flashes lit up the stands when he strode to the plate for his first at-bat in the second but he hit a fly ball to left-centre field. "I don't think Ichiro is under any pressure," Servais said. "He's certainly earned the right to partake in this series. He's off to a slow start this spring, but I thought his timing was better today, he just missed a ball he pulled down the line that was foul so I thought his swings were fine. He made a nice catch in the outfield to start off the game so he'll be in the lineup tomorrow." "I just threw him fastballs," Imamura said. "I approached it with the attitude of challenging a superstar." The A's were to play an exhibition game against the Nippon Ham Fighters later Sunday. The Mariners and A's play two more exhibition games against the same teams on Monday and have a practice day on Tuesday before they open the 2019 MLB season with games on Wednesday and Thursday.